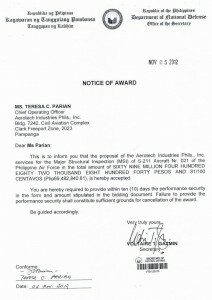 Aerotech Industries Philippines was awarded a P69,482,840.81 contract to perform a Major Structural Inspection (MSI) of S211 #021 of the Philippine Air Force. 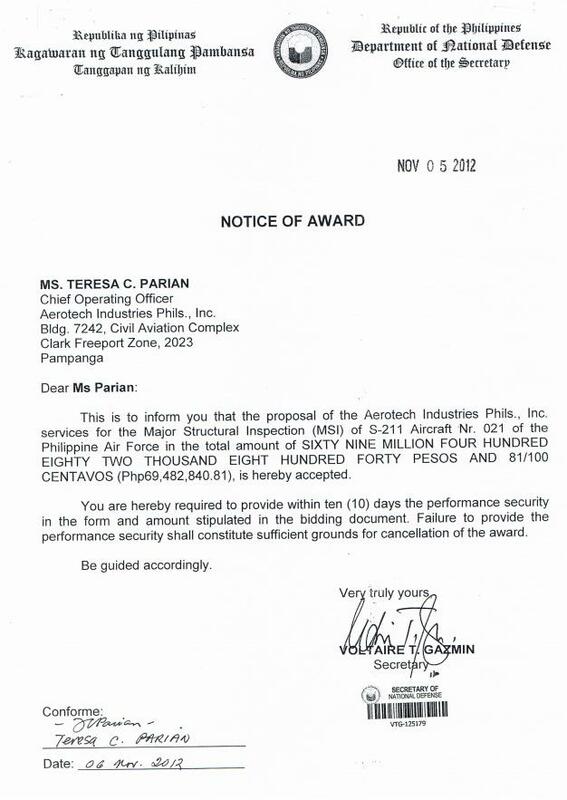 Teresa Parian, CEO of the company was given notice on the 6th of November 2012. MSI, alternatively referred to as Programmed Depot Maintenance (PDM) or Inspection Replace As Necessary (IRAN), is a process by which the subject aircraft is taken apart and all its components — with the exception of the engine, ejection seat, and similarly self-contained systems — are evaluated and then replaced when required. 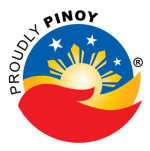 As per the DND’s 1st semester Procurement Monitoring Report, it issued the following resolutions in connection with this project. For additional information about efforts to keep the S211 in the air, see the following Timawa.net thread.